Please note: This is an Denali Pure brand replacement part, not an OEM product. This product is not affiliated with any OEM brands and is not covered under any warranties offered by the original manufacturers. Any warranties for this product are offered solely by Denali Pure. All mentions of brand names or model descriptions are made strictly to illustrate compatibility. All brand names and logos are registered trademarks of their respective owners. 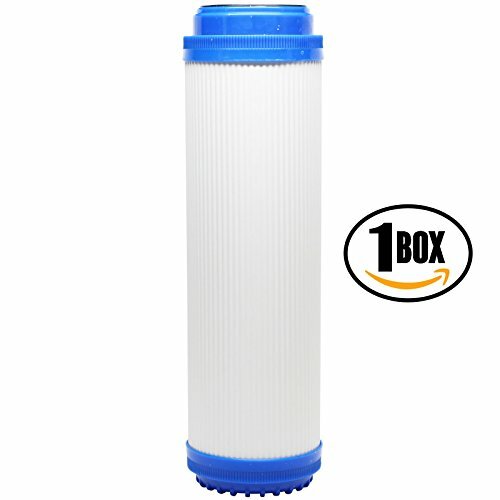 Universal 10 inch Granular Activated Carbon filter. Improves taste and clarity while retaining beneficial nutrients by reducing chlorine, fine sediment, odor, silt, rust. Removes undesirable and possibly harmful waterborne contaminants, particles, chemicals and microorganism. Reduce water bottle waste and save money while also helping the environment by using water filters. For the highest quality water and best contaminant reduction replace the filter every 6 months. On Sale for a Limited Time! If you have any questions about this product by Denali Pure, contact us by completing and submitting the form below. If you are looking for a specif part number, please include it with your message.